Paracoccidioidomycosis (PCM) is an endemic disease geographically restricted to Latin America, from Mexico to Argentina; Brazil is the most endemic of all countries. Chile and the Caribbean islands are not affected. No outbreaks have been reported. Currently, phylogenetic studies divide the Paracoccidioides genus into two species, namely, Paracoccidioides brasiliensis and Paracoccidioides lutzii. The former has a widespread distribution except for the central and northern regions of Brazil where P. lutzii preferentially occurs. Three phylogenetically diverse P. brasiliensis cryptic species have been recognized as etiologic agents of this mycosis. These fungi are thermally dimorphic that exhibit two morphotypes, a mold under 28 °C and a yeast in cultures at 35–37 °C, as well as in tissues. The yeast reproduces by multiple budding in a manner resembling a pilot’s wheel. The genus Paracoccidioides is only known in its asexual stage, although molecular techniques have allowed its classification in the phylum Ascomycota, order Onygenales, family closely related to the dimorphic fungi Histoplasma capsulatum and Blastomyces dermatitidis that present sexual stages in the genus Ajellomyces. The natural habitat of the P. brasiliensis complex has not been defined although it is supposed to be the soil preferentially at sites where the environment has a high rainfall index and the soils show optimal permeability, a combination associated with high relative humidity and abundance of vegetation and watercourses. P. brasiliensis is capable of entering into prolonged periods of latency as is demonstrated by those patients diagnosed outside the recognized endemic areas years after having abandoned the endemic Latin American zones. The mycosis predominates in adult males (13:1) but this gender difference is not observed in children or adolescents. Two types of clinical presentations are recognized, the acute–subacute (juvenile) and the chronic (adult) forms of the disease. A residual, nonmycotic active form characterized by fibrosis, is also recognized. This mycosis tends to run a chronic progressive course affecting preferentially the lungs and is accompanied by dissemination to mucous membranes, skin, adrenals, and reticuloendothelial system; other localizations include central nervous system (CNS) and bones. The initial stages of the host–fungal interactions are not known as the habitats of the Paracoccidioides complex remain undefined; experimental animal models have shown that inhaled conidia settle in the lungs and convert into yeast cells, thereby initiating tissue colonization and dissemination through blood/lymphatic vessels. 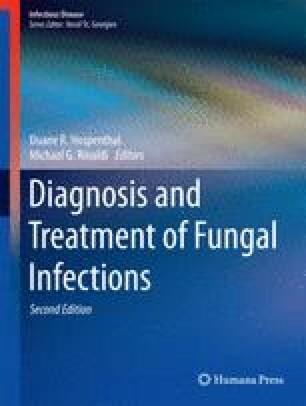 As for treatment, three different classes of antifungals are currently used to treat this mycosis, with varying success. They include sulfonamides, the polyene amphotericin B (AmB) and its lipid formulations, and certain azoles. Case reports indicate that azoles and sulfa compounds can produce positive results in not too-severe cases. However, for immunocompromised juvenile-type patients or in cases with CNS involvement, no standard treatment is available. First- and second -generation azoles, such as itraconazole and voriconazole, have emerged as therapeutic options for the control of the mycosis with the former counting with enough experience to be recommended as the choice medication.